Spring is just a few days away, which means that it’s almost time to get the garden ready to plant in most parts of the country. “But wait,” you might be thinking, “I don’t have any room for a garden!” Well, you don’t need enough room to re-create the White House’s Rose Garden in order to enjoy gardening—all you need is some time and a few extra dollars. Cinder block gardens are quick and easy. One good idea that needs no special skills at all is a cinder block garden. Simply stack them how you want, fill the holes with dirt, and plant your petunias. It’s super easy and, even better, you can take it down when winter comes. Conversely, if you have the time and ability, you can even create your own concrete planters. Just find some items you can use to create the shape you want (remembering to leave room for plants—trust me on this one! ), get a bag of quick-setting concrete, mix, pour, and wait. In a day you’ll have something unique and worthy of your flowers. Do note flowering plants are best when using such planters—homemade or otherwise—because some companies that make these blocks use Fly Ash, which is a byproduct of power plants that burn coal. But don’t let that scare you off the project! Instead, if you want to use such a garden to grow edible plants (including herbs) simply keep them in small pots or line the openings with a food-safe plastic lining of some sort. Using an old palette is a great option when ground space is limited. If you’re not a fan of the concrete look, then you can convert an old palette into a vertical garden. 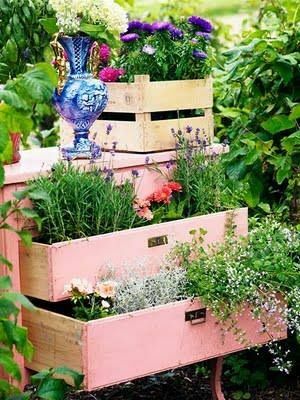 Some advantages include the fact that palettes can be had cheap (even free in some cases) and the garden is vertical in nature, which is a great option if you’re cramped for space. You can even use blackboard paint on the front so you can label what you plant. Got an old suitcase laying around? Turn it into a planter! A trend that’s become popular in recent years is finding anything old and turning it into some sort of planter. Everything from dressers to luggage to chairs to old sinks to even shoe organizers can be used to brighten up your outdoor space. The best part is that you might have something just sitting around your place that can be used, or you can get them super cheap at old thrift stores, flea markets, and even garage sales. The only limiting factor is your imagination. You don’t need outdoor space to garden successfully—not even a small balcony. All you need is a window that allows some light and a few containers. Of course, if just plain pots bore you, there are a few ways to spice it up a bit. This is a wonderful way to grow herbs indoors. The first can be found at this link and is my favorite. Don’t worry that the website is in Spanish, as you don’t need to read it to know what’s going on. Basically, all you need are some empty jars, a few adjustable hose clamps, and something you can mount them to—it really is that easy! You can even paint the jars and boards to match your décor. Bottle gardens are a good choice for those who are too busy for a lot of plant maintenance. Another idea is to create “bottle gardens.” The instructions on how to create them found here uses glass bottles, but plastic ones will also work. The best part is that these are self watering, so as long as you keep the bottom section filled with water (which should only need to be filled once a week or so) you’re good to go. This makes them a great choice for those who are busy or tend to forget. All of these projects can be done in a day or even a few hours, and they don’t take a lot of money. And don’t worry if you’ve never tried to grow anything before—these ideas are so simple you’ll have a green thumb in no time!